The Bridge integrates with your building's BMS. Set HVAC controls to respond to incoming occupancy data. Enjoy 5% or more on energy savings due to automated HVAC usage. Our Bridge solution is an integration of Wi-Fi based occupancy data into building management systems to transform buildings into smart and responsive occupant-driven systems. 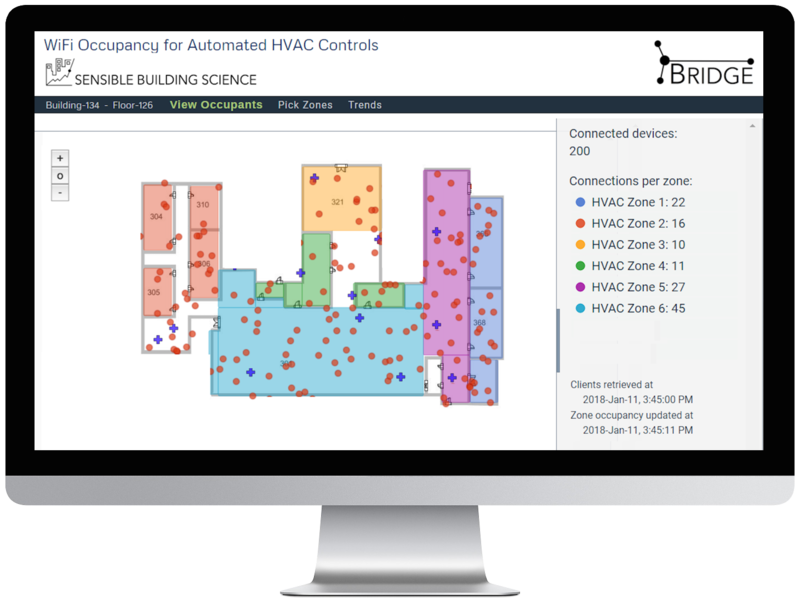 The Bridge solution leverages existing real-time Wi-Fi activity data to produce BACnet ready data for building automation system optimization. Matching building operation to occupant needs has the potential to reduce operating costs while providing the optimal indoor environment. As shown in the example above, the Bridge reduces utility costs by reducing ventilation run times. As a customer you receive Bridge occupancy data in your building automation system where you can create your own occupancy thresholds to improve efficiency. Connected buildings are significantly more eco-friendly and yield 5% or more proven energy savings. WiFi enabled devices are approximately located on your floor maps. The device data are analyzed in each HVAC zone indicated by a user-defined coloured zone. The Bridge then converts the data into a ‘virtual occupancy meter’ for each unique zone. Finally, the data is sent to your building automation system. The virtual occupancy meter data is anonymously stored for your records and can be accessed via the Bridge’s API by third party developers to create new applications such as lighting control. Public: Solution Overview contains a high-level description of the Bridge middleware, how it converts WiFi data into occupancy and then communicates the data to building controls. Private: Request the Postman Collection and Environment (must have Postman downloaded to use). Private: Request deployment documentation that covers the install of the Bridge product. Private: Request a Solution Architect Document that describe how the Bridge can drive 3rd party applications. Device location and count are updated every 5 minutes.